Madison, WI—October 19, 2015— As the open enrollment period for the Health Insurance Marketplace approaches, a crucial community program is beginning its third year, bolstered by a new $1.3 million gift. Open enrollment for 2016 coverage begins in 13 days on November 1, 2015 and runs to January 31, 2016. 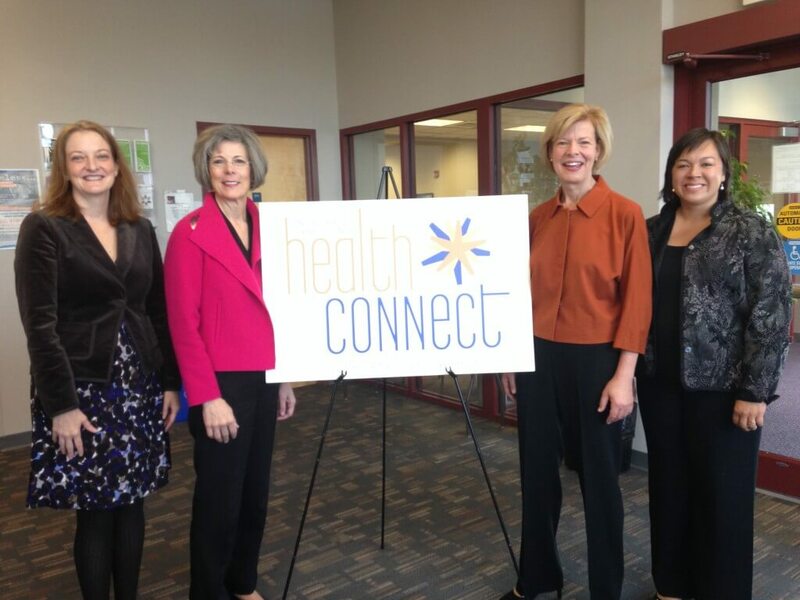 At today’s press conference, United Way of Dane County announced its groundbreaking HealthConnect program will continue for a third year, following a new $1.3 million gift from UW Health. United Way HealthConnect helps low-income individuals and families pay for their portion of their health insurance premium. Since United Way HealthConnect began in 2013, more than 1,300 Dane County individuals have been insured. HealthConnect helps individuals and families who earn between 100% and 150% of the federal poverty level (FPL). For a family of four, that income level amounts to about $24,000 to $36,000 per year. 40% of uninsured Americans who qualify for the Marketplace earn between 139% and 250% of the FPL, which emphasizes the need for programs like United Way HealthConnect. “In Wisconsin, the average amount of tax credits came to $315 per person last year. 83% of the state’s consumers could buy a plan for $100 or less a month with tax credits. For other residents, programs like United Way HealthConnect will really make a difference. We are so grateful for the generosity of UW Health,” noted Congressman Mark Pocan. At the press conference, Falk was also joined by Senator Tammy Baldwin, representatives from Representative Mark Pocan’s office, UW Health Community Relations Director Juli Aulik and United Way of Dane County President Renee Moe. The Health and Human Services Department is establishing a new goal of 10 million Americans insured by the end of 2016. Nationwide, about 17.6 million consumers have gained coverage, including more than 9 million last year. In Wisconsin, 183,682 consumers enrolled through the Marketplace. “For coverage to start January 1st individuals must enroll –or reenroll –by December 15th. Each year the process gets simpler—you can even enroll using your cell phone. There also are trained professionals who provide free and confidential assistance to those shopping,” reminded Falk. For more information on the Health Insurance Marketplace, please visit healthcare.gov or call 1-800-318-2596. To find a local assister nearby, please visit https://connector.getcoveredamerica.org/widget/. For more USDHHS Region V updates, be sure to follow @HHSRegion5 on Twitter and use the hashtag #GetCovered. For more information on HealthConnect, please call 211. The free hotline is open all day, every day. A 211 representative will guide Dane County residents to where to apply and find more information. To find more information online, please visit www.unitedwaydaneco.org/healthconnect.